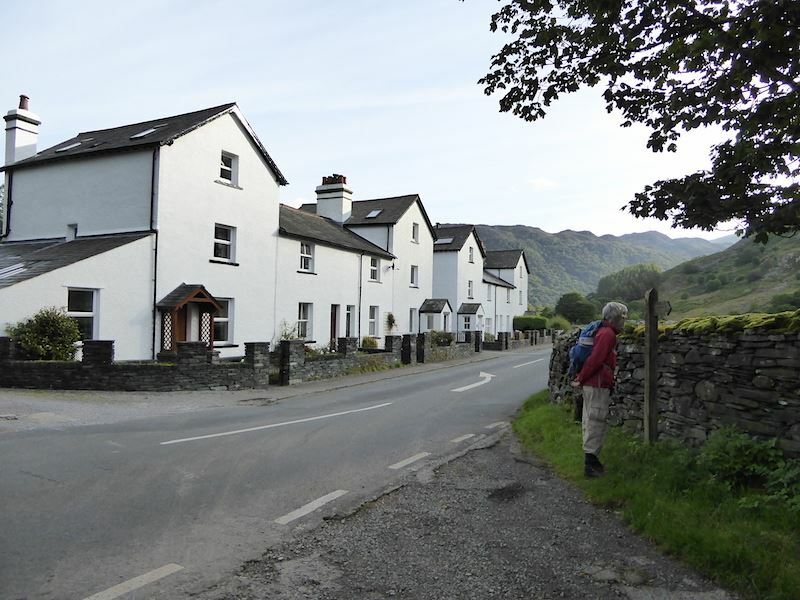 Early morning in a very quiet Stonethwaite village. Base Brown ahead of us as we walk along to Mountain View Cottages. The walk starts here just opposite Mountain View Cottages. 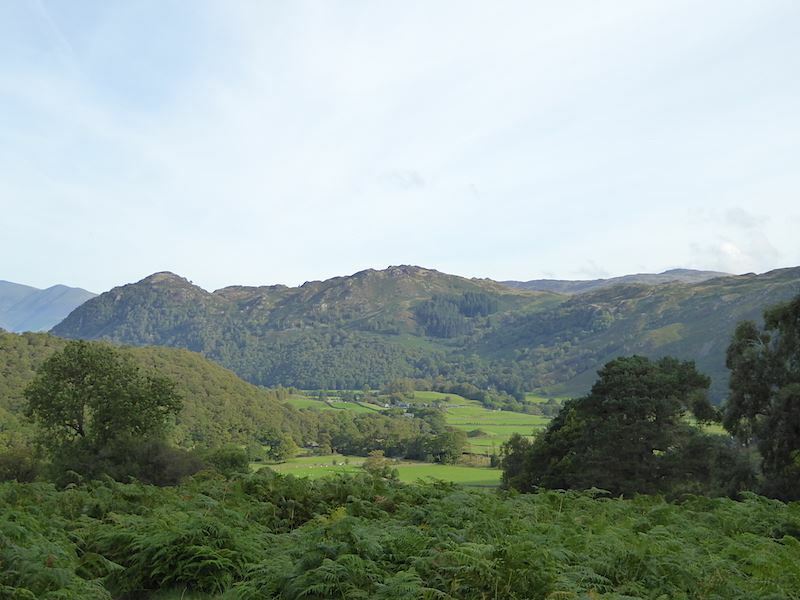 Looking back along Borrowdale as we follow the path through the shoulder high bracken. 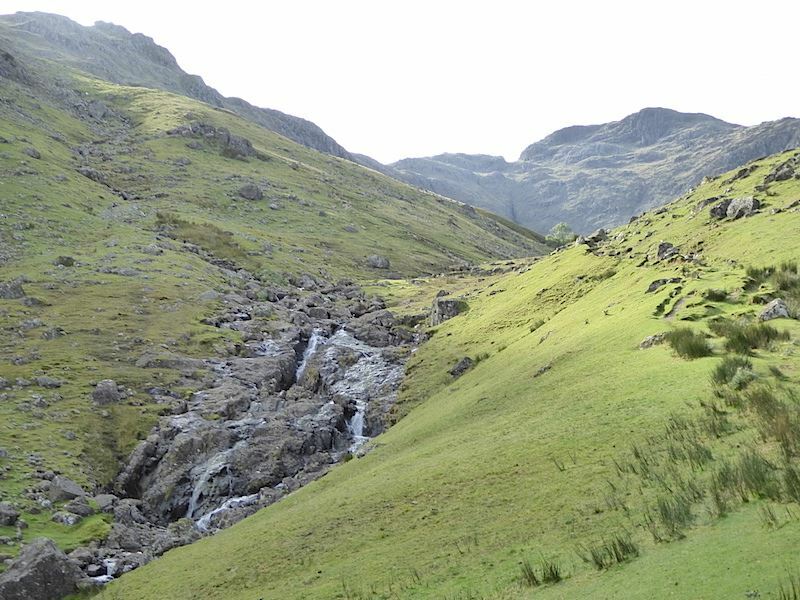 Reaching the waterfalls in Combe Gill with a view of Combe Head over on the right. Higher up the path you get a good view of the becks and moraines at the head of the valley. 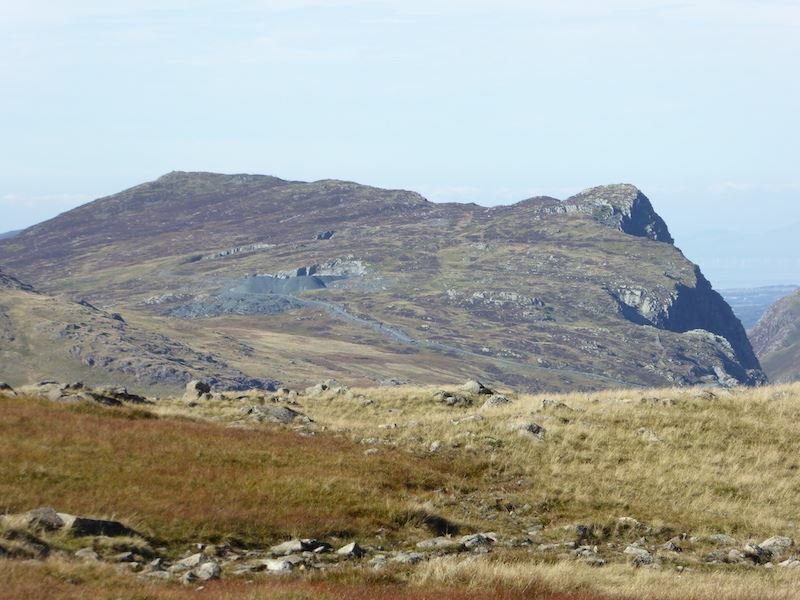 A close up of Combe Head. 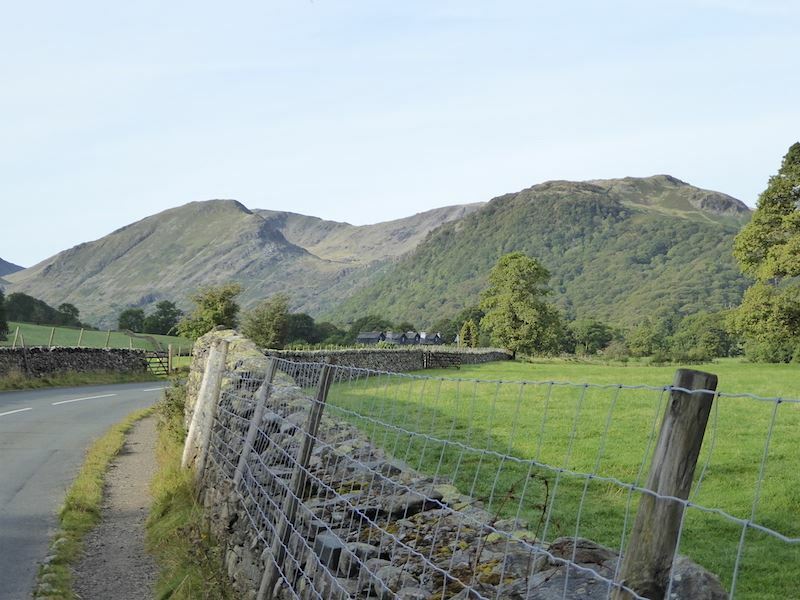 Looking back down our route from Borrowdale. 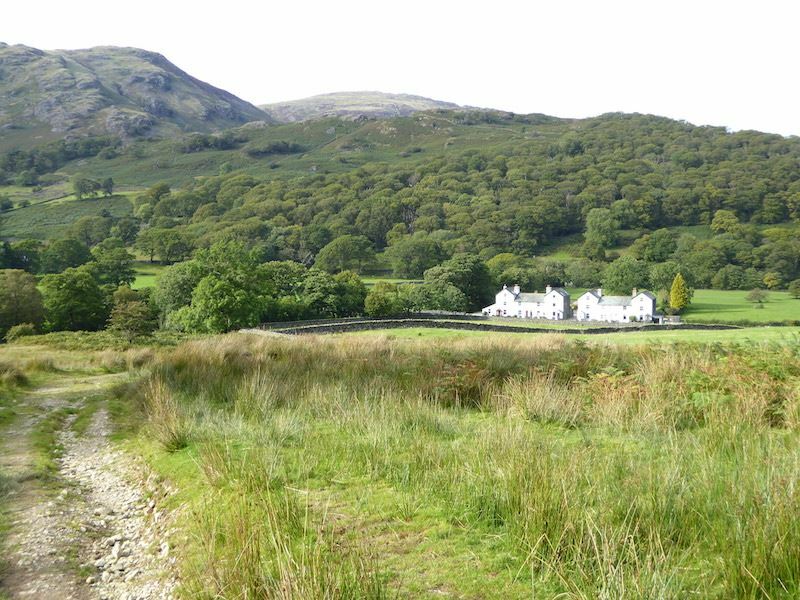 Our starting point, Mountain View Cottages, is the long white building more or less in the centre of the photo. 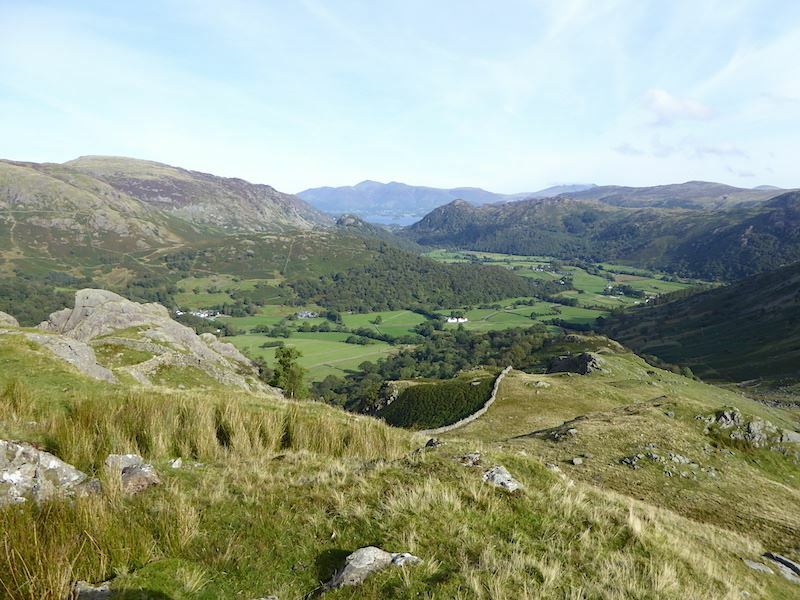 Looking across Combe Gill to Bessyboot, the summit of Rosthwaite Fell. 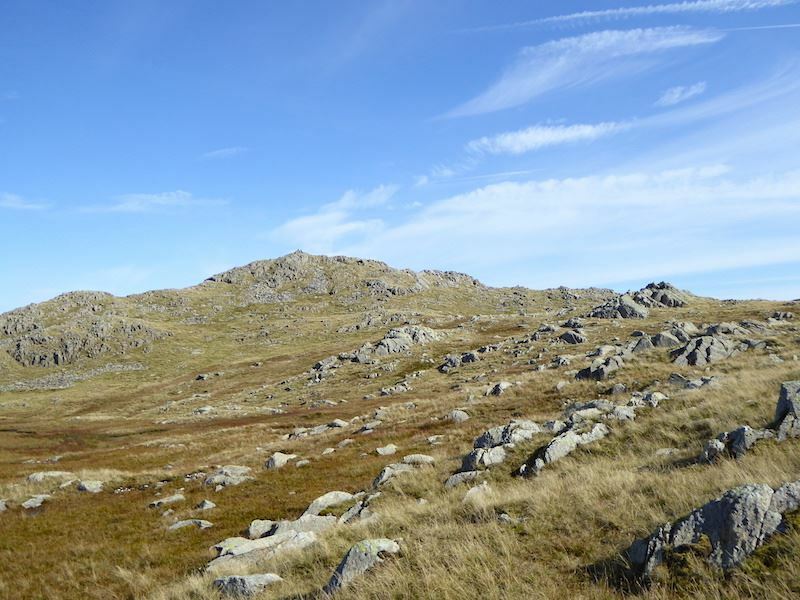 After climbing continuously since the start of the walk we reach a very small patch of flatter ground where the legs can recover for a minute or two before starting the next uphill section, Here I’m looking to the west with a view of where we were two days ago. 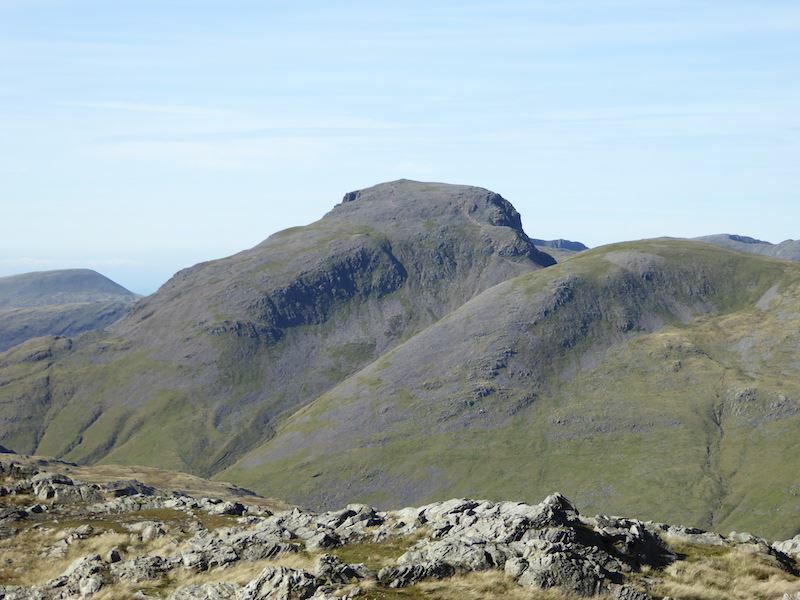 On the centre of the skyline is Grey Knotts and to the left of it the summit of Brandreth. 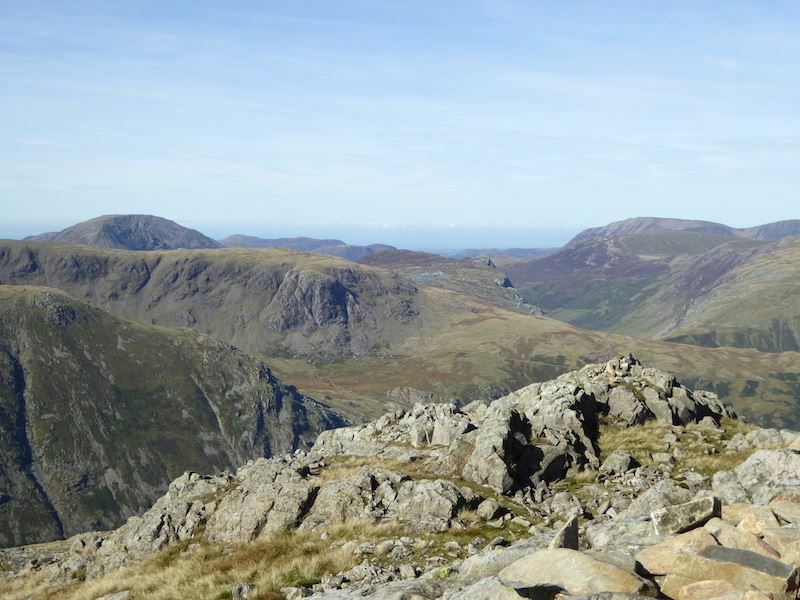 Just peeping out over on the right is Fleetwith Pike. 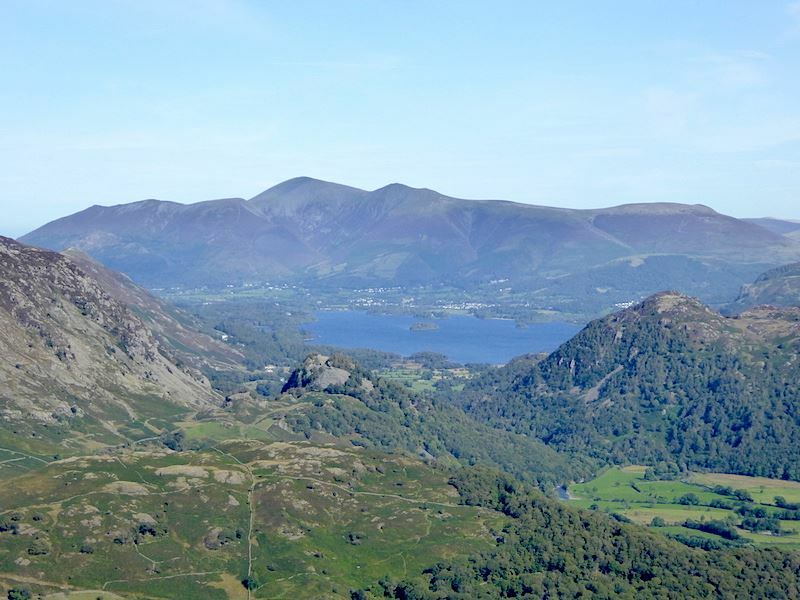 A view of the Skiddaw range behind Derwentwater and Keswick. 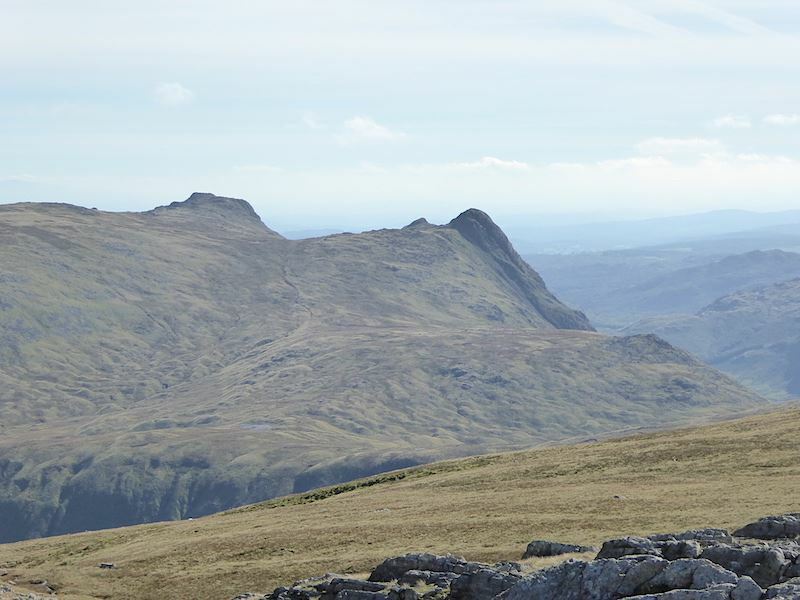 The little rocky topped fell in the centre is Castle Crag. 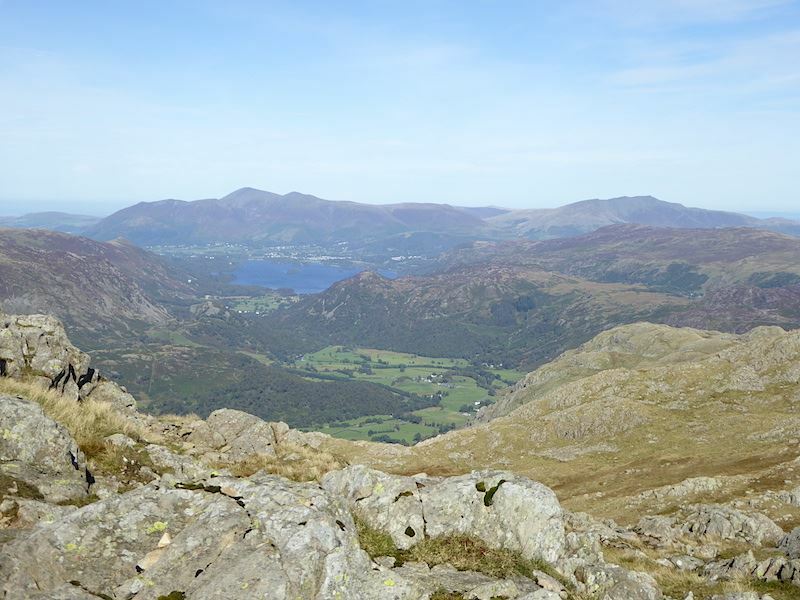 The Dodds and the Helvellyn range far over to the east of us. 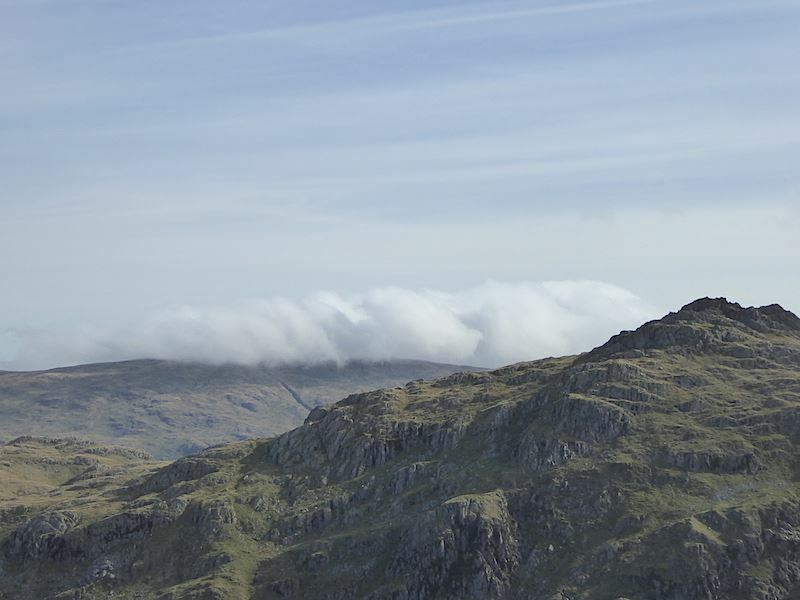 Cloud atmospherics rolling over Greenup Edge in exactly the same place as we saw them on 26th September. 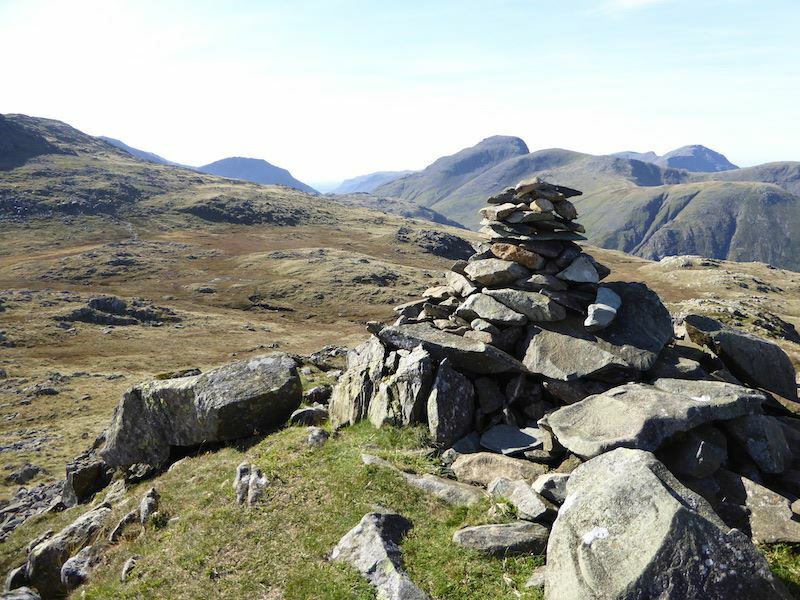 In the centre is Base Brown, to its left rises Green Gable and rising left again is Great Gable. 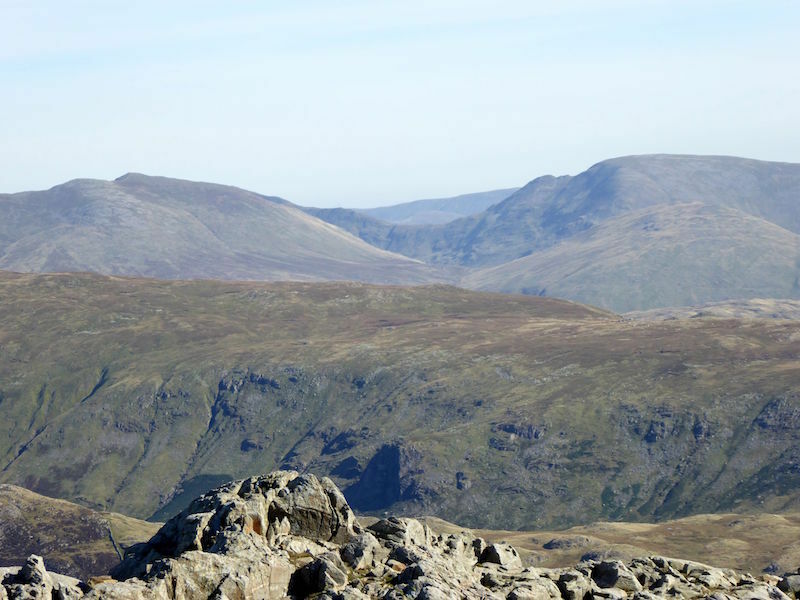 Brandreth and Grey Knotts are over on the right skyline. Well, the legs have had a good rest while I’ve been capturing the views so we’d better get going again before they seize up completely. 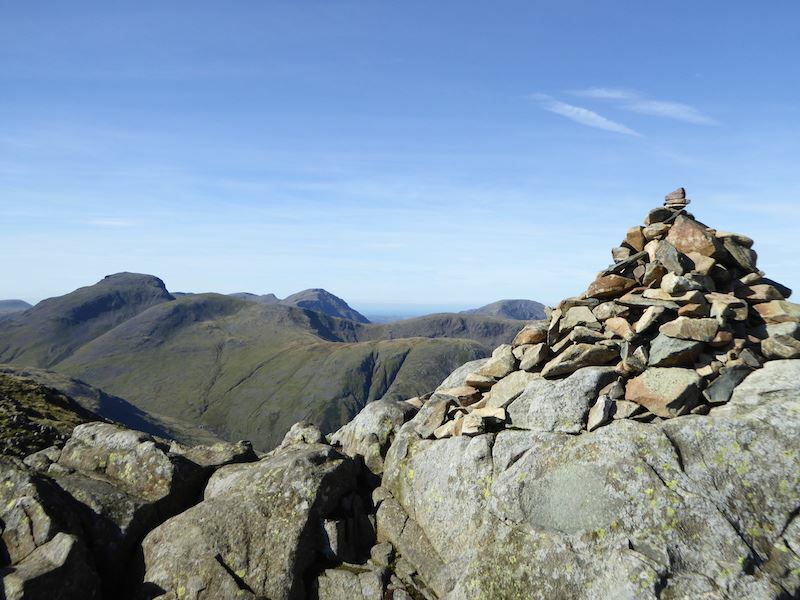 From left to right – Great End, Lingmell and Great Gable. Good to see them without the usual swirls of cloud around them. 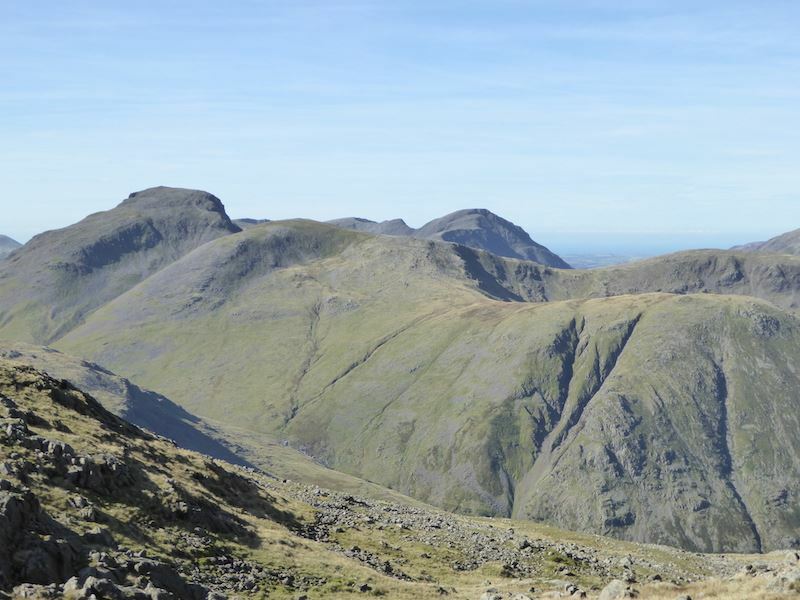 From left to right – Harrison Stickle, Loft Crag and Pike O’Stickle, collectively known as The Langdale Pikes. 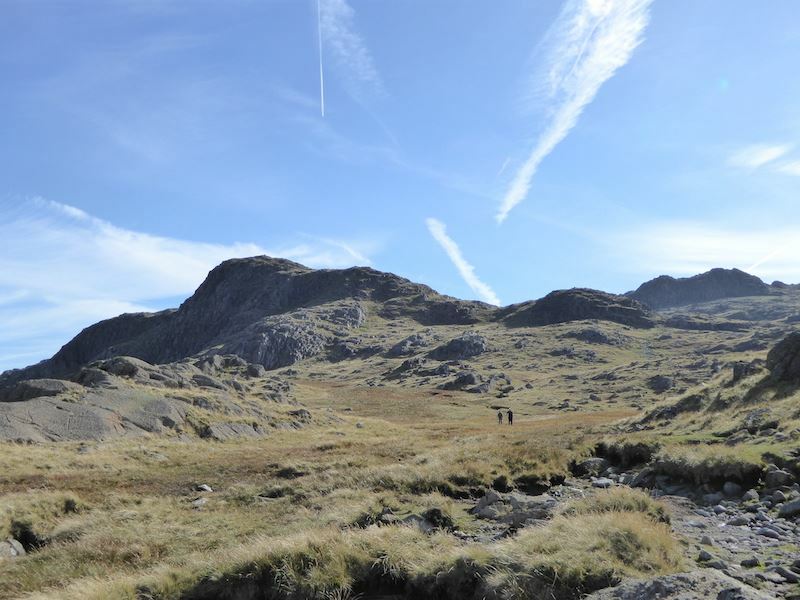 Up ahead is Combe Head, which we’ll be going across to after we’ve been up to Glaramara. 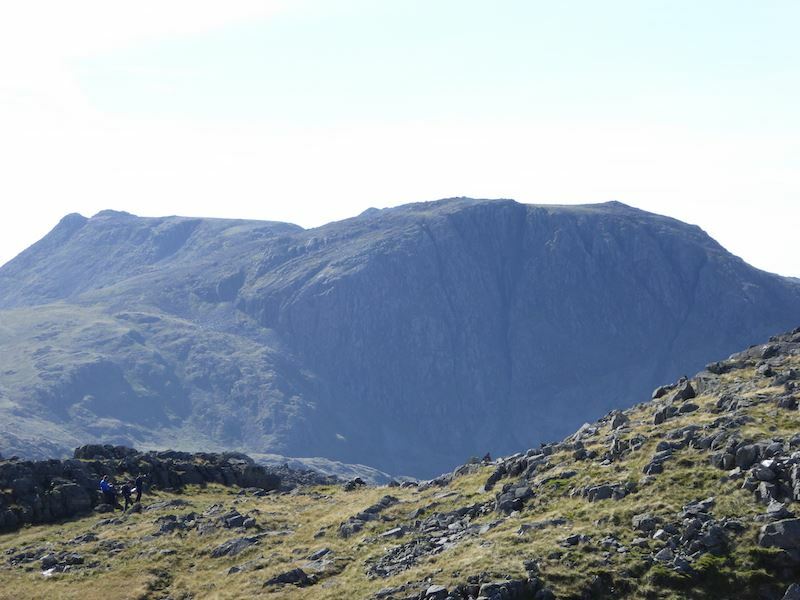 The path we took up Great Gable two days ago can be seen quite clearly just above Gable Crags on the right of the fell. 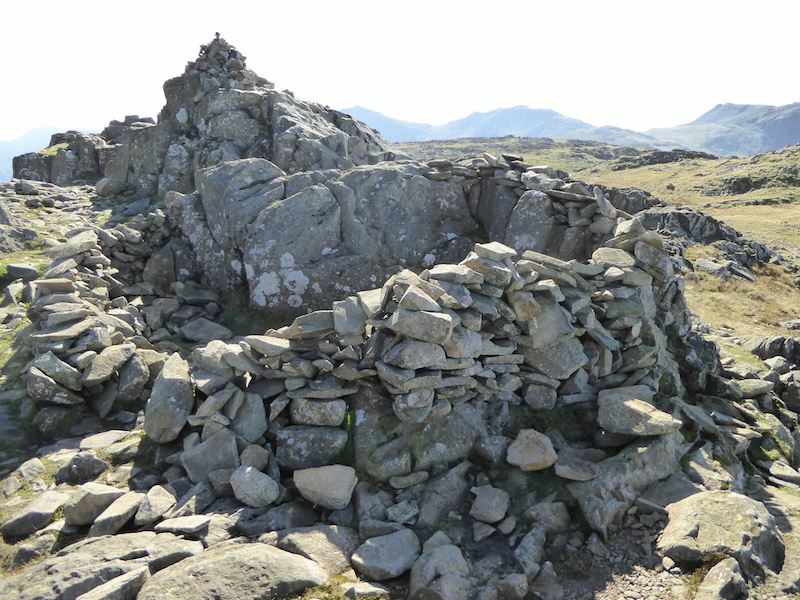 The summit cairn and wind shelter on Glaramara. Don’t be fooled by that sunshine, the wind was strong and cold up here. 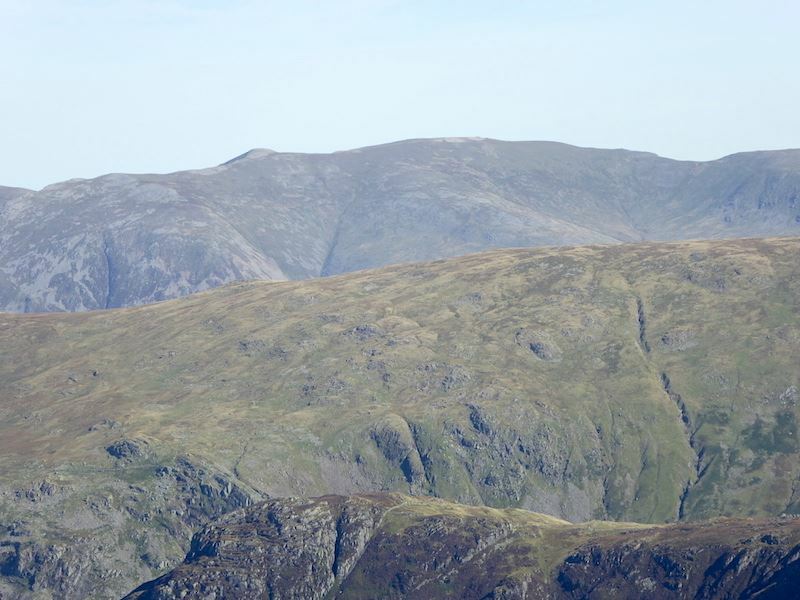 Looking over to the east from the summit and on the left is Dollywaggon Pike, which is the beginning, or the end depending on which way you’re walking, of the Helvellyn range. 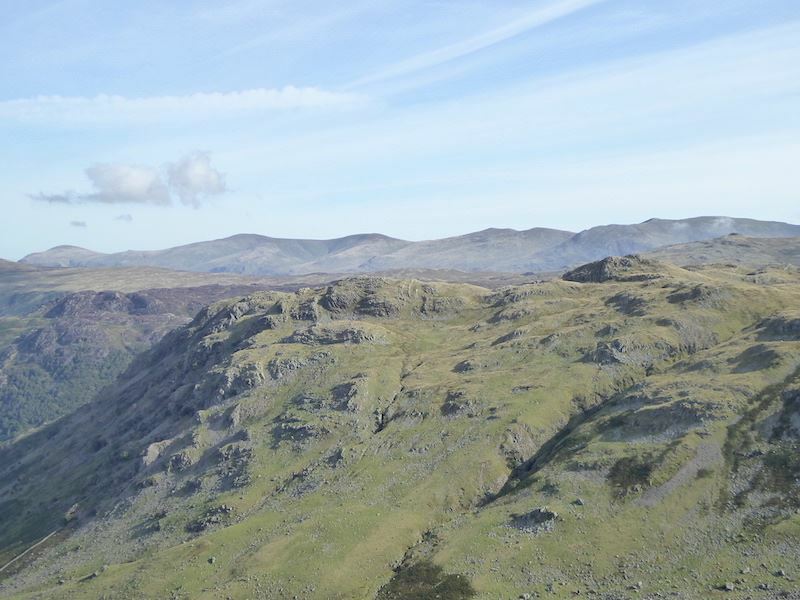 Opposite it on the right are Saint Sunday Crag and Fairfield, and below them is Seat Sandal. 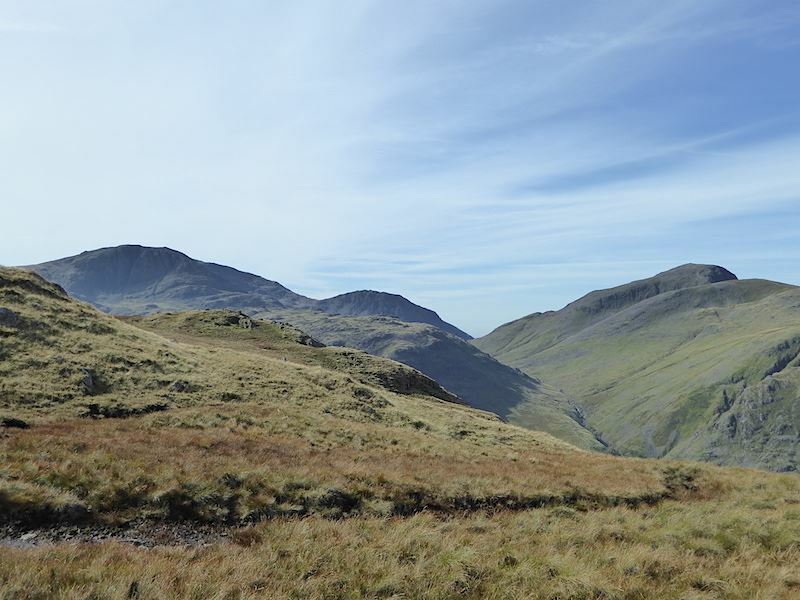 Moving the camera a little to the left and now Dollywaggon Pike is over on the right and to its left is Nethermost Pike. 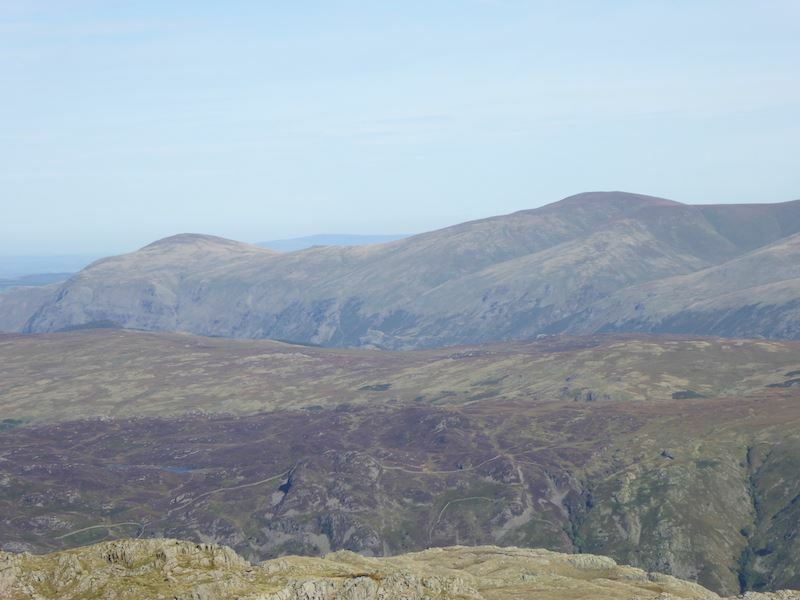 A little further to the left and the long plateau of Helvellyn is the next one along, with the peak of Catstycam just peeping up behind it. 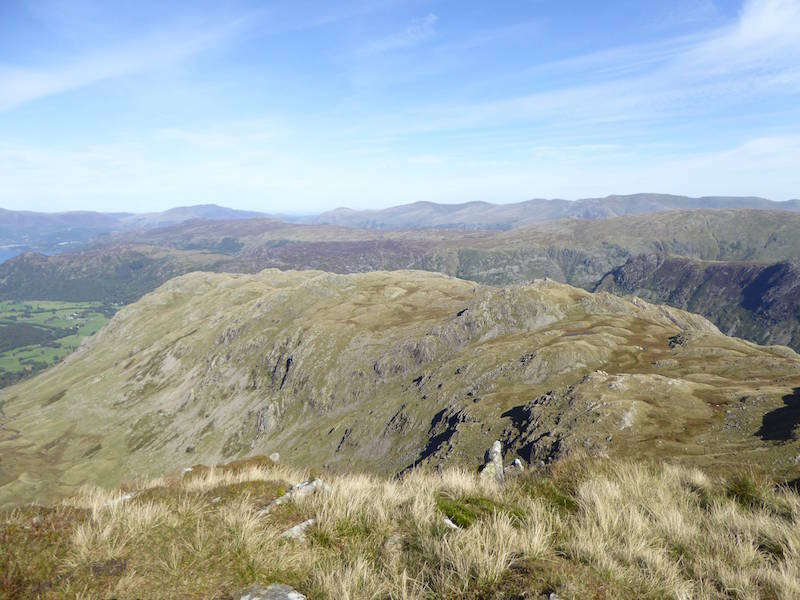 Further left again and now we have Great Dodd on the extreme left, in the centre is Stybarrow Dodd, and over on the extreme right is White Side. 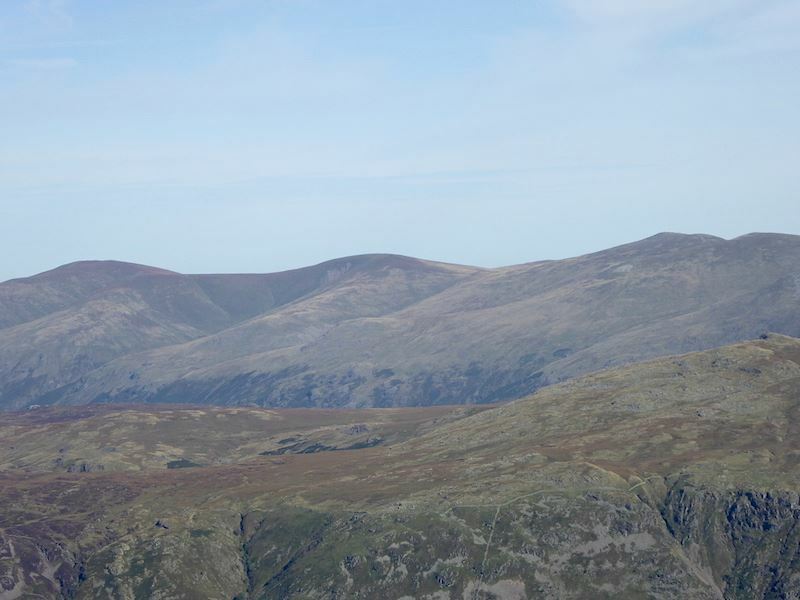 This is the end, or the beginning, of the Helvellyn range, over on the left is Clough Head and to its right is Great Dodd. 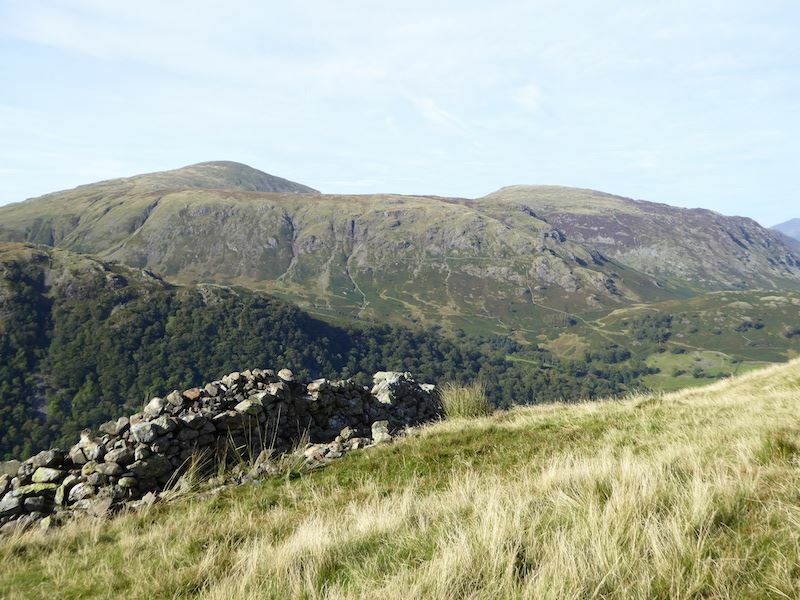 Its a long ridge walk from Clough Head to Dollywaggon Pike at the other end. 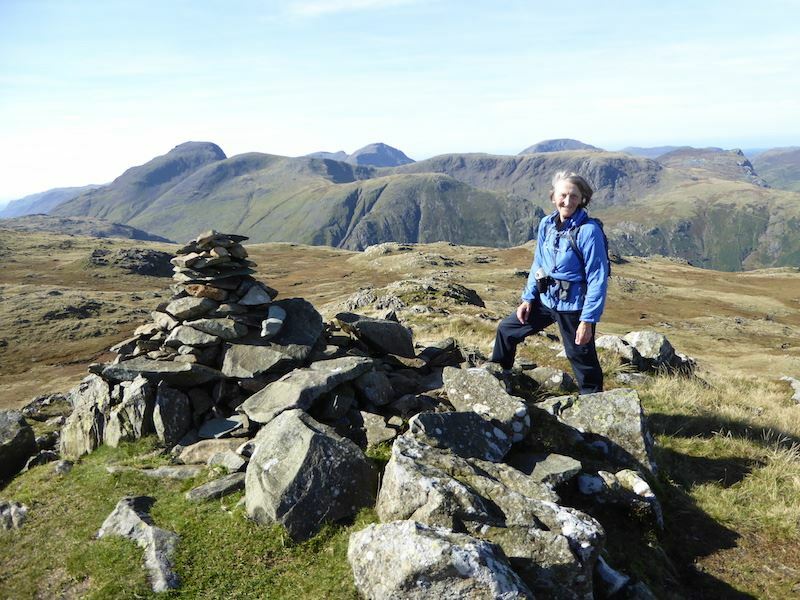 Demonstrating the latest wind-swept look on a very chilly Glaramara summit. I have to take my gloves off to use the camera, so with fingers now numbed by the cold and having difficulty standing upright I take this shot looking over to Pillar above the slopes of Green Gable. 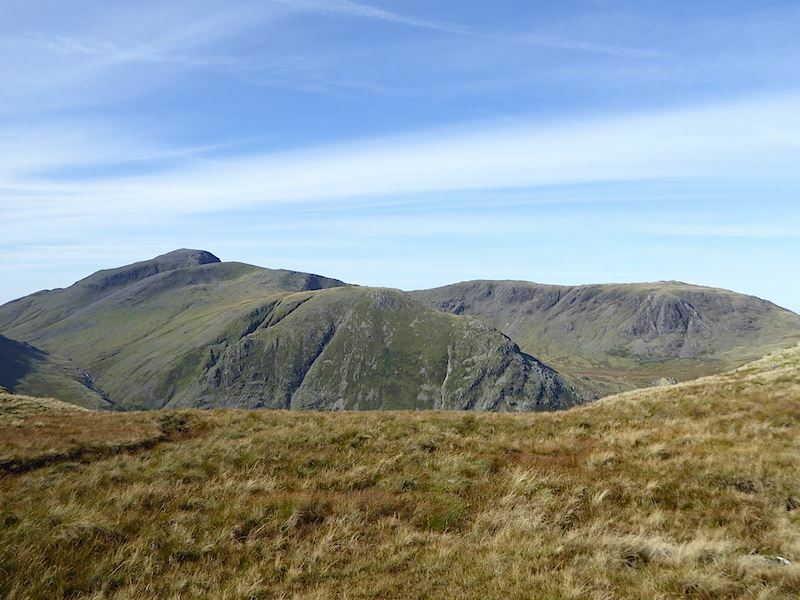 Over on the far left of the skyline is Pillar and over on the right is Grasmoor, two of the big ‘uns. 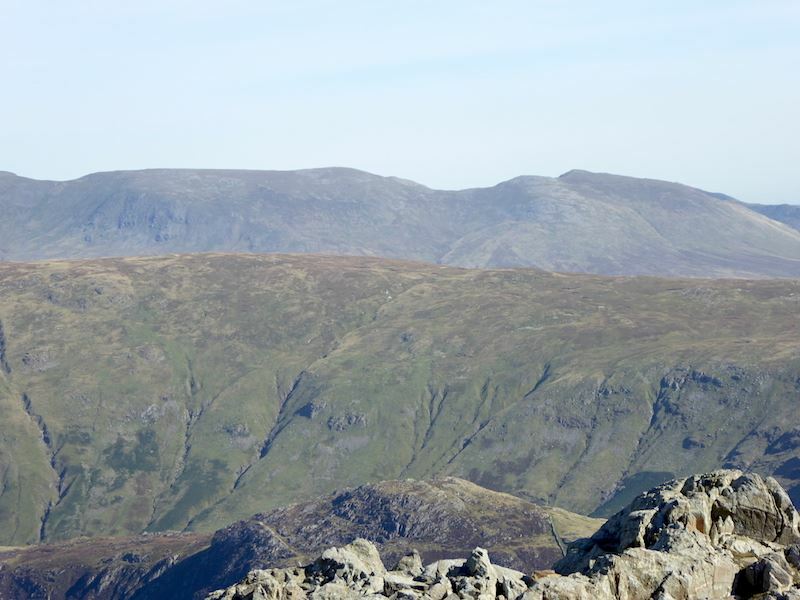 From Glaramara summit a view of two more big ‘uns, Skiddaw over on the left skyline, while over on the right is Blencathra. 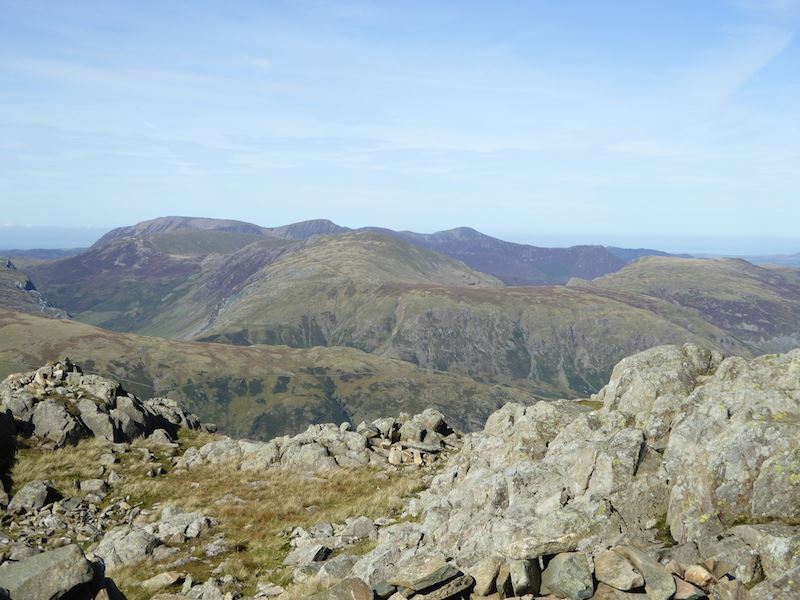 Looking across to the west and on the skyline from the left are Grasmoor, Crag Hill, Grisedale Pike and Causey Pike. Looking south west now at the huge bulk of Great End. 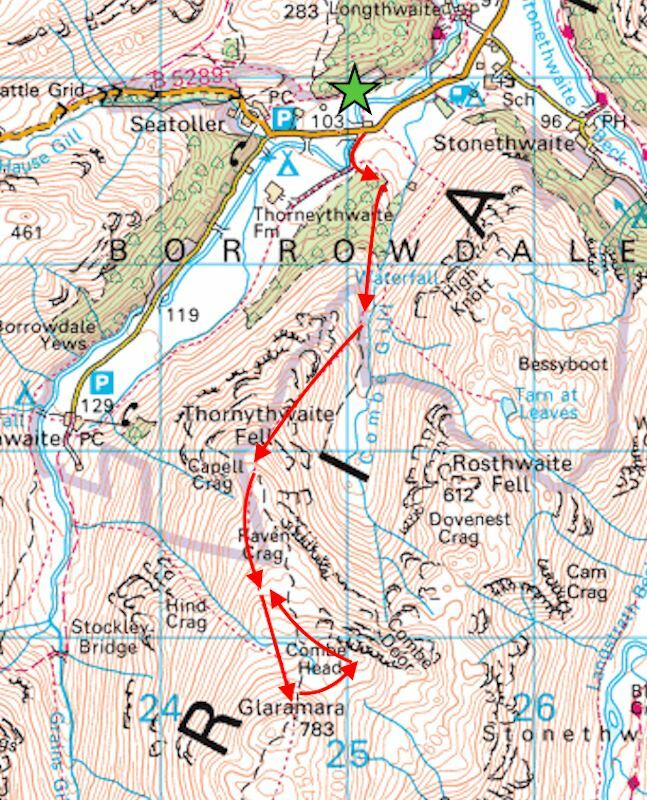 The little party of walkers just below me are intently studying their maps, the Glaramara ridge can be a very confusing place but fortunately there is no low cloud today to add to their confusion. That’s exactly why we’re up here today, you can see for miles. 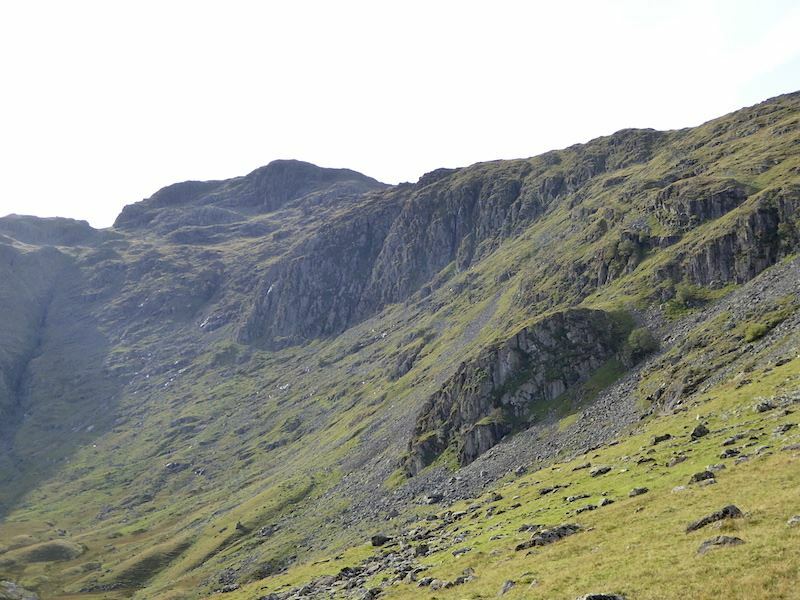 Bowfell is still recognisable even though most of its features are hidden in the shade. 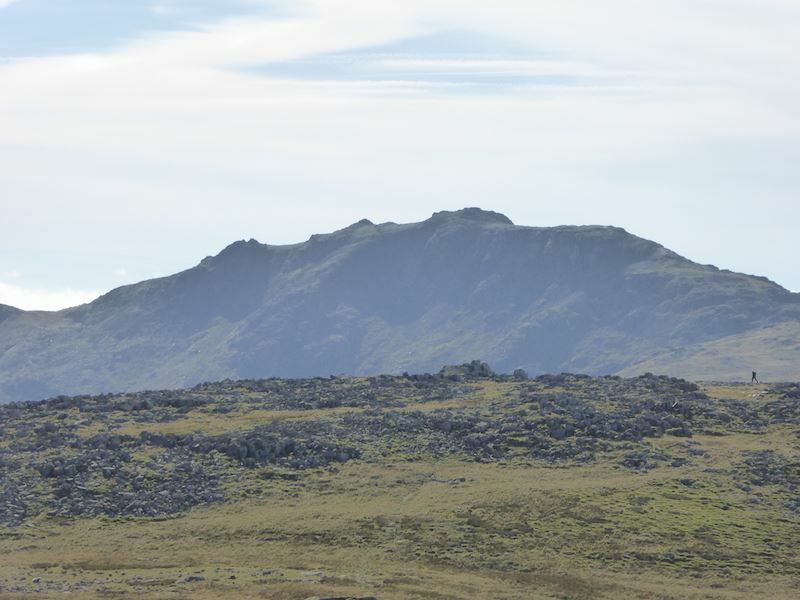 Its one feature which is still visible is the Great Slab, the lighter grey patch on it to the left of centre. 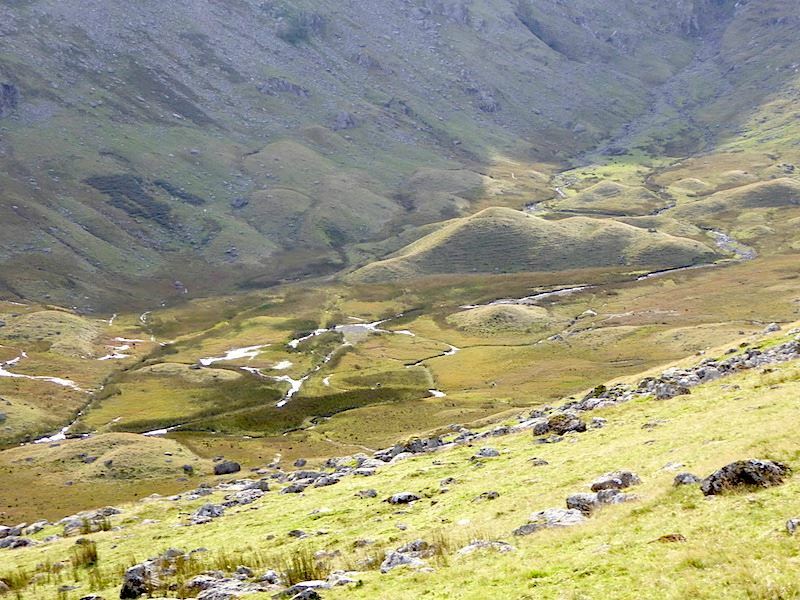 A lone walker striding out in front of Esk Pike. 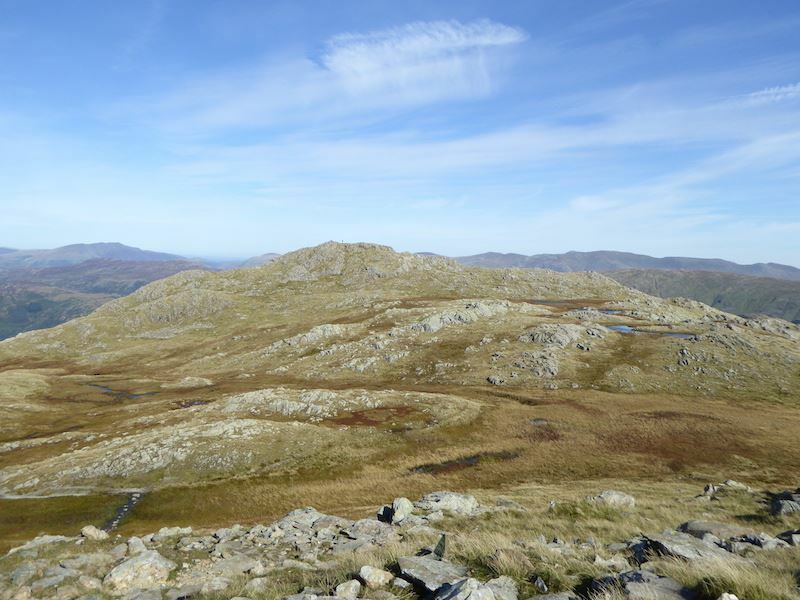 Looking westwards from Glaramara summit. 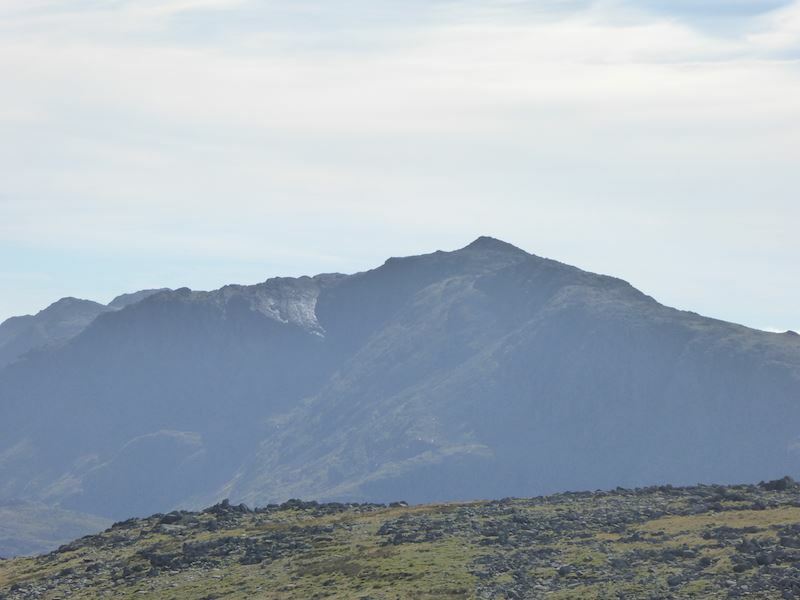 I think its time we got ourselves off this cold and windy summit and drop down to somewhere a bit warmer. 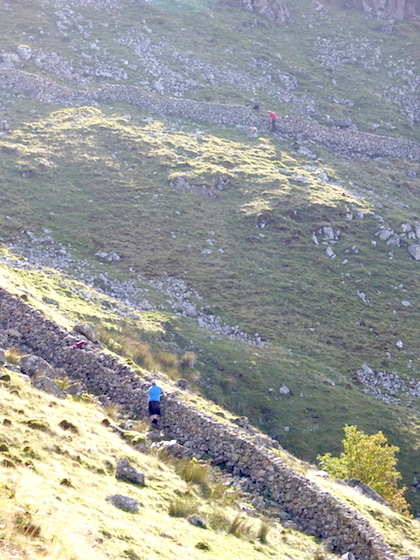 We’re down off the summit now and walking below the ‘rock step’ which leads up to it. 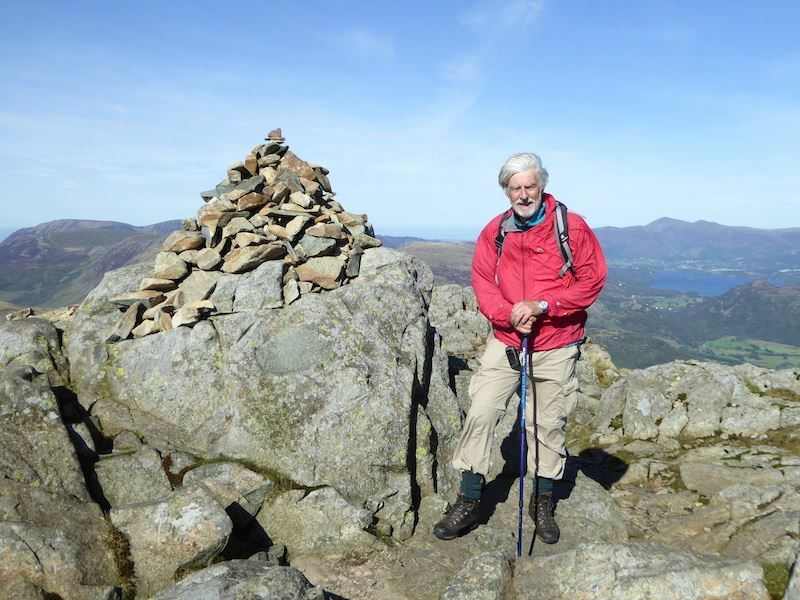 Its not difficult, but you don’t have to climb it to get to the summit, you can simply go round and walk up the back of it. Being a walker and not a climber you can guess which route I took. Making our way over to Combe Head, its full of lumps, bumps and squelch and a pair of wellies would have come in handy walking across here. 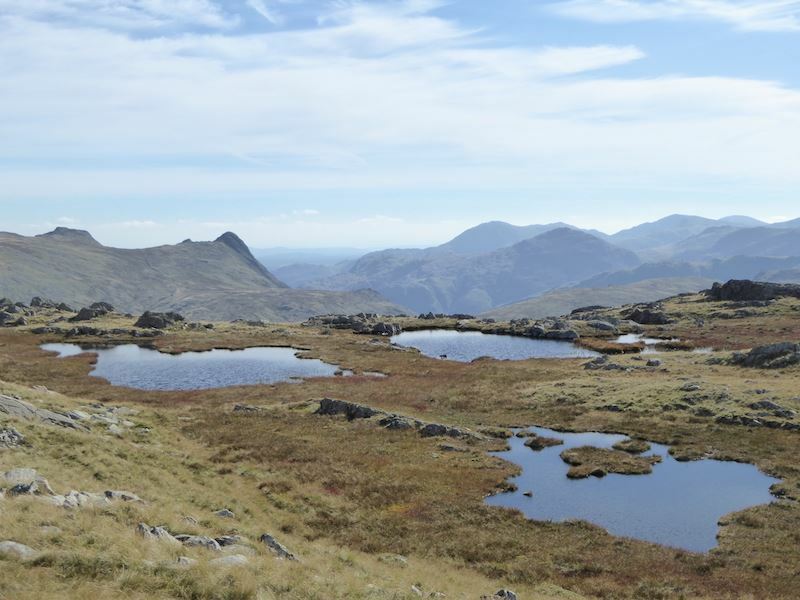 The tarns at Combe Head. 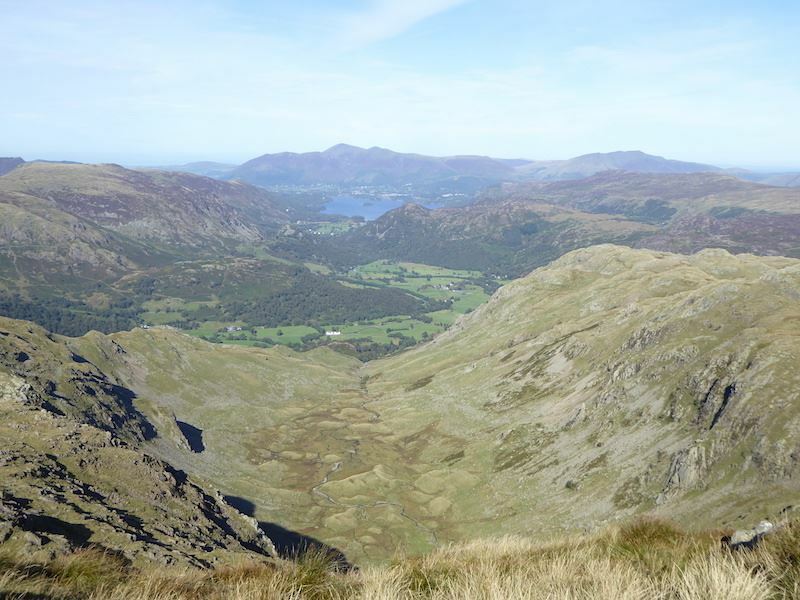 The view down Combe Gill and Borrowdale from Combe Head. 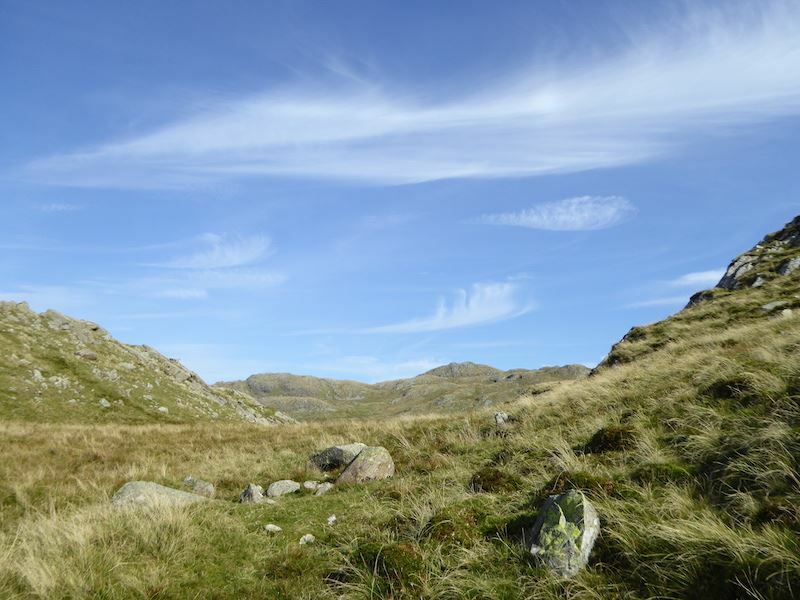 Looking over Bessyboot to the eastern fells. Wind-swept and squinting against the strong sunlight. I could have done with my thicker jacket and winter trousers up here, brrr. This strong wind wasn’t mentioned in the forecast or I’d have put them on. 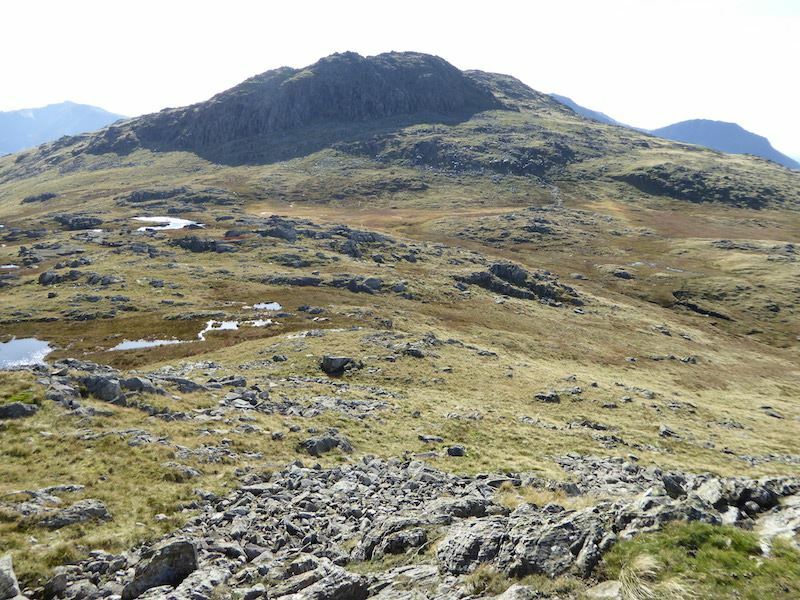 A look back across the squelchy col to the summit rocks of Glaramara. Making our way back down I take this close up of Fleetwith Pike. 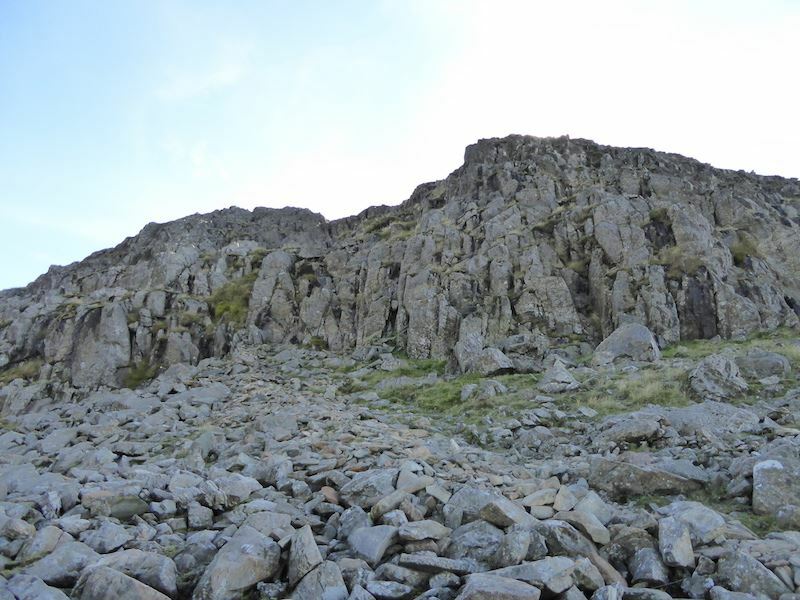 The summit is over on the left with the rocky spur of Black Star over on the right. 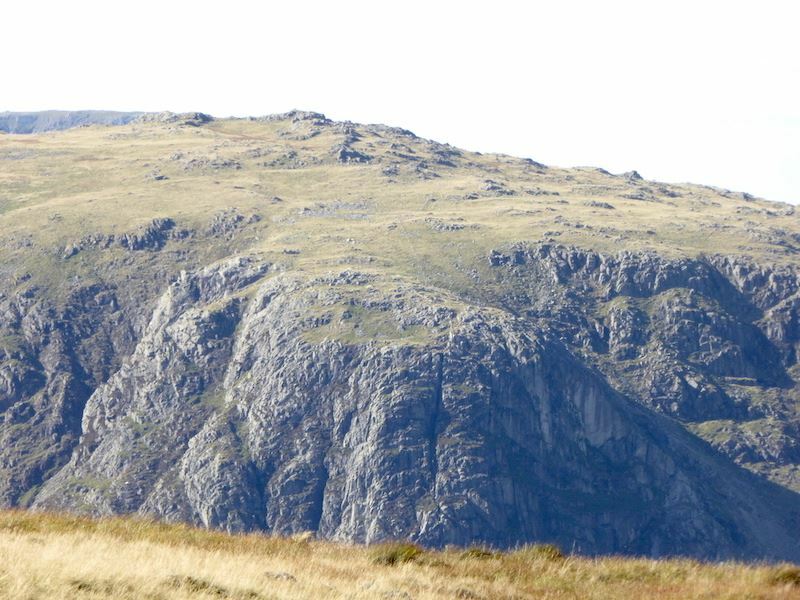 I also took a closer look at the summit area of Grey Knotts, over there above the top of Raven Crag. 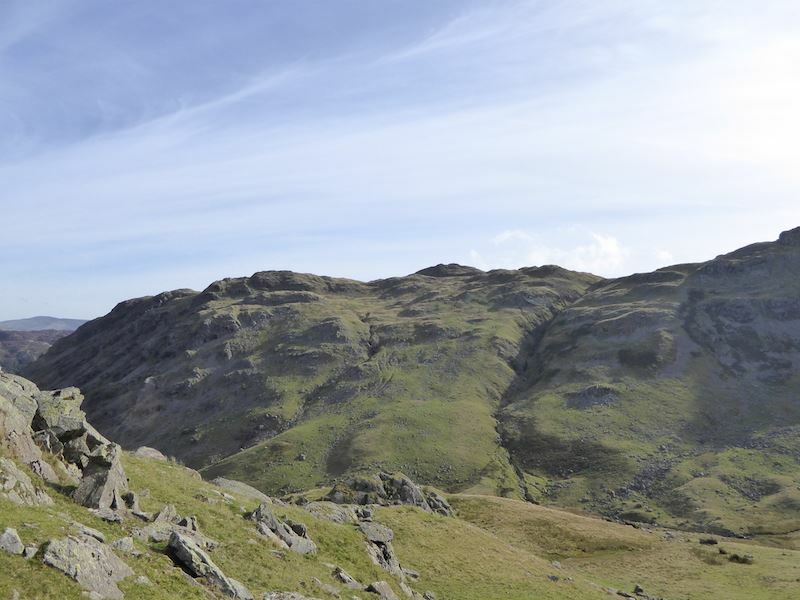 A look back at Combe Head and Glaramara, the two walkers giving a sense of scale. 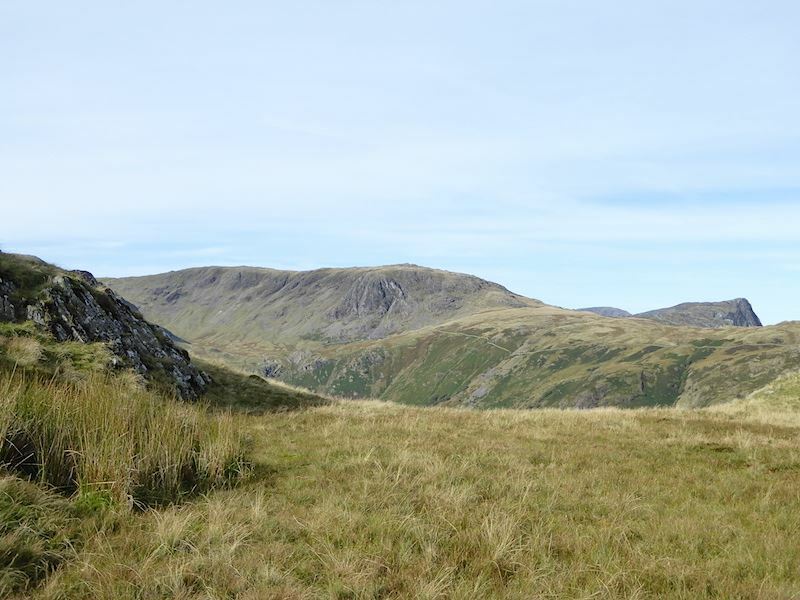 Dale Head and High Spy on either side of High Scawdel. Its much warmer down here now that we’re out of the wind. A man in blue and a man in red, both repairing the walls. We noticed them this morning as we were walking up. Bessyboot summit on the middle skyline below some odd little clouds. 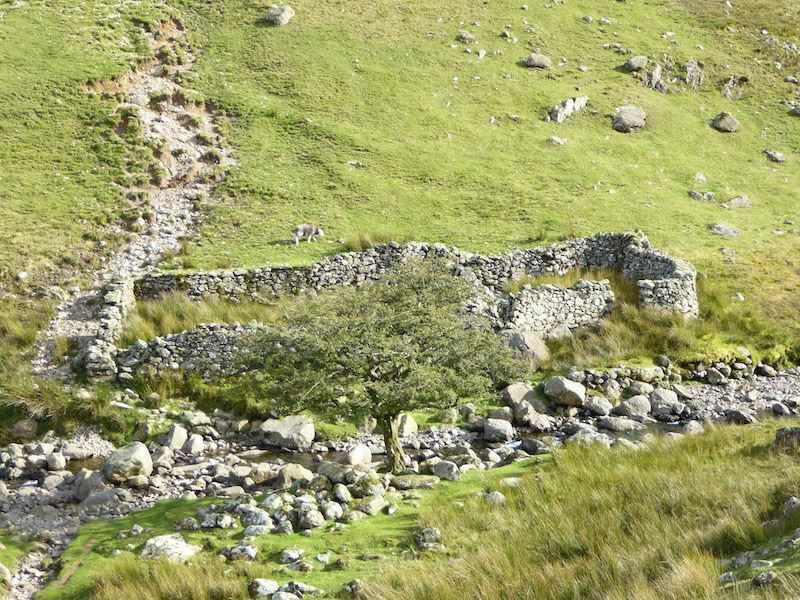 The sheepfold alongside Combe Gill. Almost back where we started at Mountain View Cottages and so that’s the end of today’s walk. 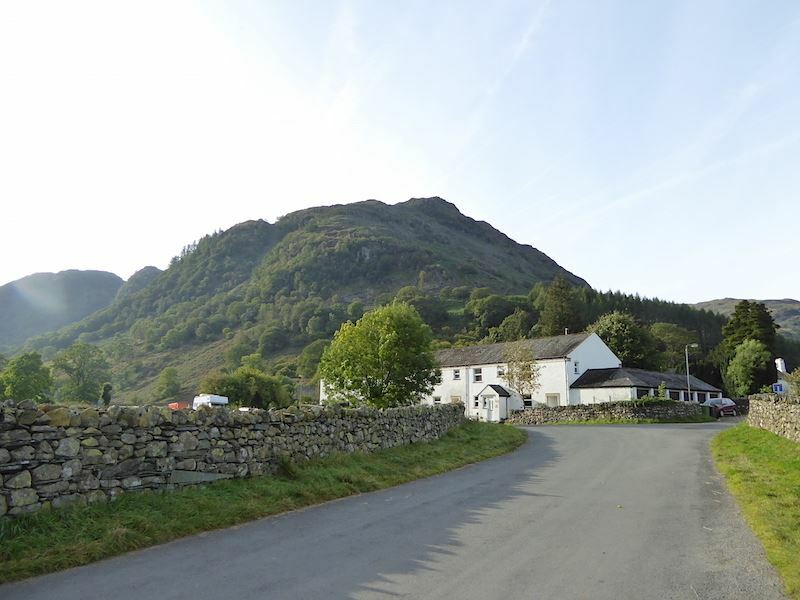 The car is just a short distance away in Seathwaite and then its back home for a cuppa.